I looked towards the voice, that of a fortyish woman, with stylish boots, dyed blonde hair, and a southern accent, who was talking to a park ranger at Katmai, 400 km southwest from Anchorage, and a long way from any part of the lower 49. I almost let her have it, because rangers have to be nice, I don’t. I’m an elder in my society, and I was a lot more in my environment than she was. I was wearing boots that had walked the over peaks in the Brooks Range, in Kobuk Valley’s sand dunes, both above the Arctic Circle, in Alaskan rivers, and on tussocks and ice. Hers had probably just spent their first time on a dirt trail. 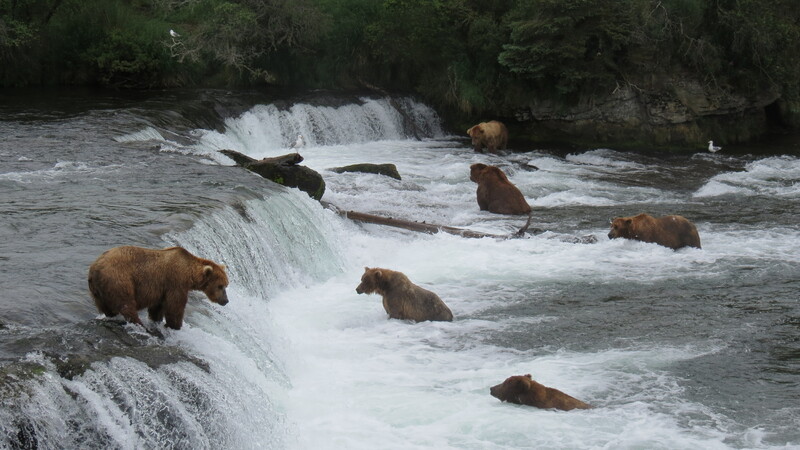 At Katmai, there are two viewing platforms at Brooks Falls, the lower, where one can go as long as one wishes without waiting or time limits, and an upper, where 40 people are limited to one hour, then have to get into line again for another hour, should they wish to see more. There is a question, and I think a good one, whether we should be having people view the bears in the Brooks River feeding on salmon. We don’t know what effect we are having on the bears. Perhaps none. Perhaps a lot. Katmai is pretty enough without having to see the bears close up, but most go to see the bears. The upper platform, next to the falls, has more fish, and that is where the males, and the big ones, congregate, so people want to go there. Forty are plenty. Put 50 or 60 there, and the last 20 aren’t going to see much. I waited for 20 minutes when I arrived, spent an hour at the upper falls, left, got back on the list again, went to the downstream viewing area a second time, skipped lunch, and waited my turn to go to the upper falls. The downstream viewing was great. 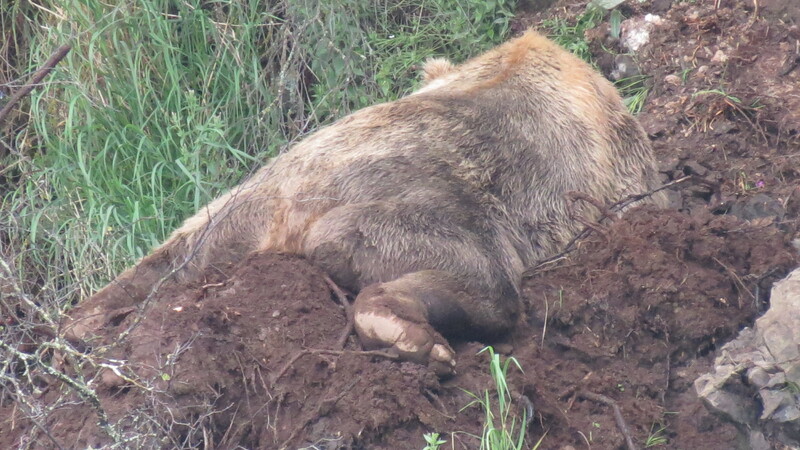 I saw a bear sleeping in the mud on the other side of the river and pointed him out to others. 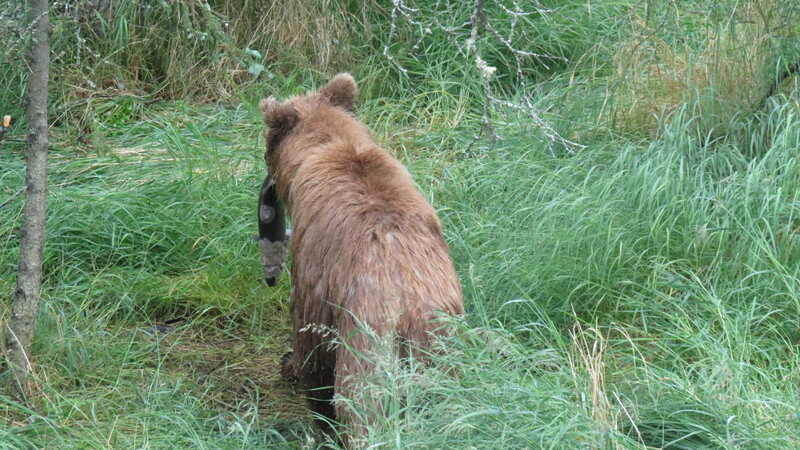 A bear ran right under the walkway with a salmon, off into the woods to eat it. There weren’t many people talking, and within 45 minutes, I was back at the upper falls. That wasn’t a long wait. That second time was special. I saw a boar chase a cub up a tree. 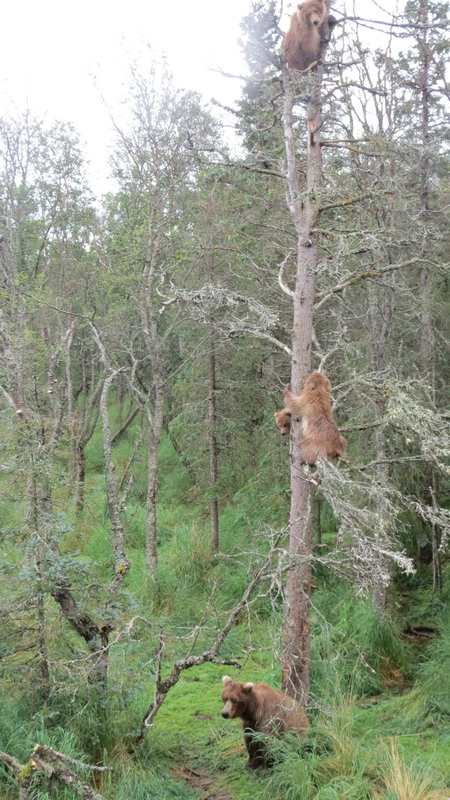 When the boar left, the mother came with two more cubs and soon all 3 cubs were in the tree. Later, another sow with spring cubs, much smaller, appeared. The whole time, several bears were fishing the river. I had a good time and as I left the check-in station, I heard the woman complain. Sow with her 3 cubs. I almost let her have it. But being an elder means having wisdom, and I knew I would be more emotional than wise if I said anything to the woman wearing the stylish boots. I would have started with the failure to properly regulate flights properly over another national park: the Grand Canyon. On 18 June 1986, a helicopter and a fixed wing collided over Tuna Creek, killing 25, many of whom were Dutch tourists, who likely burned to death before they hit the ground. The FAA stepped in. I would then have asked how much better off we might be today had we regulated the financial industry, so that people who almost took down the world’s economy, which is still struggling years later, got bonuses that themselves were in the top 0.5% of US income. I might have asked her to imagine Katmai as a private park with a bus to the viewing platforms, so people wouldn’t have to walk 1.2 miles, selling tourists a salmon, then putting them on a tram over the falls, so people could look down and drop salmon to the bears, getting that “special” picture to post on their wall. Ten years ago, during bear hunting season, many people went into Lake Two in the Boundary Waters without permits. It’s an easy lake to get to, and surprise–people don’t always regulate themselves. When my wife and I tried to camp there, with a permit, coming the other way, we were tired, disappointed, and angry that the lake was full. We had to paddle a lot further before camping. Afterwards, rangers were posted at the entry point to ensure people had permits. Regulations make it possible for me to have my rights protected, too. Even with rules, parks get trashed; without them, I shudder to think what would happen. She probably would have screamed at me if I asked when a person’s right to own a firearm interfered with my right to be safe at my local Safeway, where Gabby Giffords was shot. Yes, I know, guns don’t kill people, people kill people, because if they are angry, it is easy to move a finger without thinking of the consequences. Using a knife or a fist makes it a lot more personal, risky to the attacker, and requires enough time where maybe somebody can think “I shouldn’t do this,’ which is what I did before telling the woman in stylish boots what I thought of her. 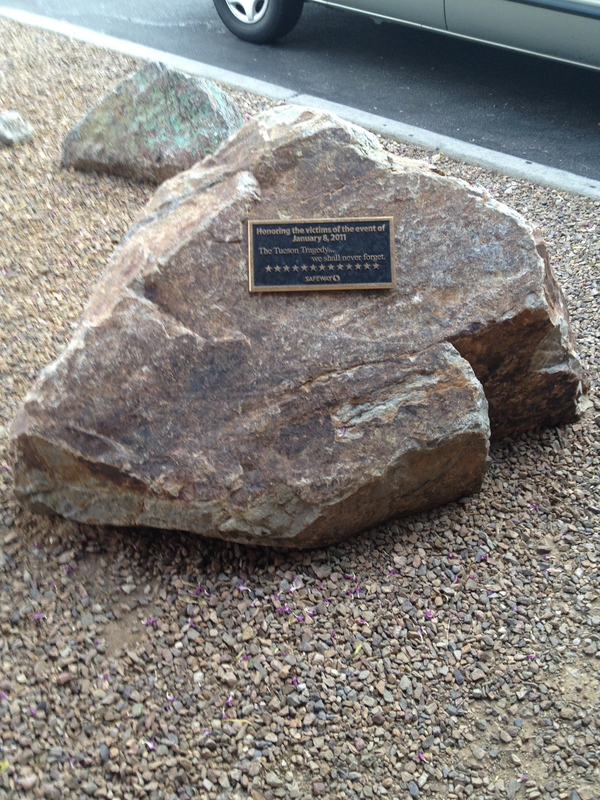 All but forgotten now, the memorial to the 6 killed and 19 wounded in Tucson. Just a question: When was the last time you heard “Newtown”? I’d like to know what the lady would think of regulating food quality and safety, something a good looking congressional candidate from my district wanted to do away with, since he had never had seen a case of typhoid fever or hepatitis, or a child die of shigella or salmonella. That candidate scared the daylights out of me and missed winning the seat by 4,000 votes, because people were angry about the Affordable Care Act, many of whom were on Medicare or military retirees, ironically receiving government funded medical care. I wonder whether she would kick me with those stylish boots. Or think. This entry was posted on July 29, 2013 at 11:50 and is filed under KATMAI NP, MY WRITING, National Park Odyssey, UNPUBLISHED OUTDOOR WRITING. You can follow any responses to this entry through the RSS 2.0 feed. You can leave a response, or trackback from your own site.